MH switches to Reigate, which has no Wetherspoons! Just to confirm the current Wetherspoon consolidation - here's another dozen which recently went, just like Streatham. Bodmin, Burnley, Coatbridge, Leicester, Warrington, Wick, Hove, Balham, Redfield, Rickmansworth, Worthing, Paighnton. No secret, or insult requirement - just facts! Yes, Whale Jnr, I expect that the C&S will thrive in that vibrant area, now that it has shaken off the yoke of the reprehensible Tim Martin. As for the claims of our friend below, I would say that any fair-minded soul reading the what-pass-for-comments on, say, the Market, in Reigate, would make up their own mind as to the truth of those. Sadly MH has resorted to bizarre personal insult; I am a lone poster, who simply gave local comment about this Wetherspoon deserted unit. Discarded for the same reasons as The Grapes on Sutton's High Street - which seemed to be trading very well - JDW have found that, sometimes, two town centre venues are one too many. As they found in Worthing, and elsewhere. Whale, your patience is commendable, I'm humbled, but you are wasting your time trying to reason with this fool. 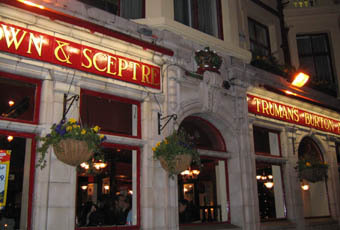 I know the area, and the pub too, and my experience tallies with yours. Randolph is reportedly one of a host of usernames used by the same person including, apparently, Tradervic, Tempest, Dolphox and many, many others. He appears to have an interest in some Surrey pubs and to be a Wetherspoons shill. He spends his time as many fake people, pretending to represent a consensus running down competition, or trolling folk such as you, who write informative or entertaining reviews, seemingly having nothing better to do with his time. He has been well and truly rumbled by many regular users of this site, however. Anyway if it has a long-term future then that is great news and suits everyone. Visited on Saturday night and the place was buzzing, most tables taken. Impressed to see 9 cask pulls - 7 ales and 2 ciders. £2.40 a pint for guest beers, one was £1.99. Ales included 2 each from Cotleigh and Truman's. Very good value food even cheaper than Spoons in some cases - most main courses £6-8. Included a wide selection of burgers and the return of roast dinners. We'll be back!